Ever want to know who’s blogging along with you in the Major League Baseball family? We’ve just added a new page on MLB.com that indexes all (mostly) active accounts with the PRO theme, generally those bloggers who are employed by MLB. These range from players like Marlon Byrd and Torii Hunter to front-office execs like Bob Rose and Tommy Lasorda to MLB.com beat reporters like Jen Langosch and Bryan Hoch. Did you know the Phillies Ballgirls are on here? Check out the brand-new MLBlog of MLB Official Historian John Thorn if you haven’t already, and learn more about the origins of baseball. See what Keith Olbermann is blogging on Baseball Nerd, and get help for your roster from the MLB.com Fantasy 411 gurus. And don’t miss a chance to ask Ozzie Guillen questions and see if he answers them. It’s the only place where you can blog along with a wide variety of Major League personnel, and we’ll keep that page updated as we add new accounts regularly. With all the MLBlogs now on WordPress.com, expect that number of interested MLB bloggers to go up, too. Also be sure to see if you ranked in our Latest Leaders, as seen in the previous post, and keep the feedback coming in comments here about the new platform while also letting us know if you’ve done something special with the new WP software so we can help show off your blog. The blogging is heating up along with the temperatures. Summer is unofficially here and the MLBlogosphere is hopping. For traffic in the month of May, MetsBlog.com claimed its customary top spot in the Pro Blog category, with Better Off Red‘s Top 5 finish setting off wild celebrations in The Queen City. Once again, the She-Fan held off the guys at Red State Blue State for bragging rights among fan bloggers, while Todd Zolecki‘s run continues atop the MLB.com beat writers. 30. Indians, Cardinals, and Tigers! Oh my! 33. Baseball And Red Sox All The Way From Ireland! 37. This is what the girl thinks…. Happy St. Patrick’s Day from us at MLBlogs! Presenting today’s Irish dancers, Cockroach, Alyson, Michelle, N8 and of course Spike. Enjoy! MLB.com liveblogged the liveday from the first Spring Training exhibition through the last on Wednesday’s full day of games. Make sure you have MLB.TV and follow it to November. 9:46: It was a first day of live baseball like any other, and now it sets the routine to follow: Baseball every day. Our game is back. It goes on until November in 2009. We saw Albert Pujols back in Cardinal regalia, hitting again. We saw grand slams by Micah Hoffspauir of the Cubs and Jerry Hairston Jr. of the Reds. We saw Tim Lincecum throw an inning on live MLB.TV, at the beautiful new Goodyear Ballpark above (photo courtesy of Dan Mendlik/Indians). We saw some great plays, as if little had changed. 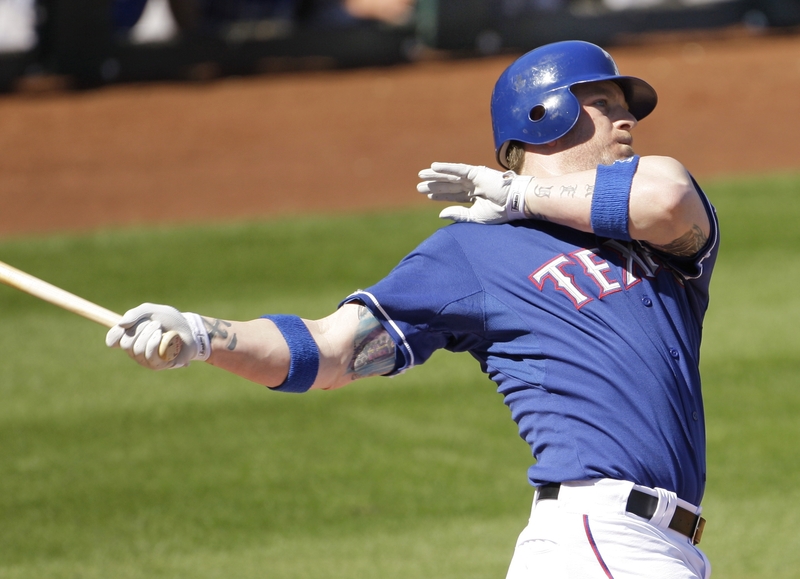 We saw Josh Hamilton homer right away as if it was 2008. We saw Alex Rodriguez get a mixed reaction when introduced for his first at-bat, and we saw him homer in his second plate appearance. We saw Nate Schierholtz go yard for the Giants as a harbinger of what may be ahead. We saw 15 exhibition games between Major League clubs and another split-squad Red Sox game against Boston College. Never has there been a full slate of games this early. We saw some live baseball on MLB.TV, and we can’t wait for more. It is coming right back at you on Thursday. And then every day after that. We saw Ryan Church and the Mets raking the ball against Baltimore. We saw bullpens active like anthills, constantly shuttling in fresh arms, often an inning at a time. Gradually the stints will get longer and longer, and one of these days, someone will actually throw a complete game. It all started on this day. We have baseball back. Fans are back on their game now, because someone finally shouted, “Play Ball!” Take it from this fan MLBlogger who already has started the daily fan ritual. 9:37: Sean Henn is the last pitcher of Day One, and he is facing Paul McNaulty of the Red Sox with two on and two out and protecting a 5-2 lead. Is this the last pitch of the day? Yes it is. McNaulty flies out to right. Twins win. They win the “Mayor’s Cup” between these neighboring spring clubs. They are 1-0 in the Grapefruit League. no-out chopper through the left side that should have been grabbed. left in the first live day of 2009 baseball. 8:54: Nick Swisher just posted on his Twitter: “first game. always big time butterflies. so happy and proud to be a part of this team. this could be something special.” In his first live game with the Yankees, helping them to a 6-1 victory over the Blue Jays in Dunedin, Swish batted fifth, drove in a run and scored once. 8:40: Twins 3, Red Sox 2 in the bottom of the sixth. Kevin Youkilis just did a dugout interview with NESN that all MLB.TV viewers saw live, and he commented on the new facial hair. “Well, I don’t know, I was getting a little bored with the goatee, decided to do a fu manchu. I call it a Youk Fu,” he said. 8:22: Watching Michael Cuddyer, just grounded out to short in the fifth. Twins holding a 3-1 lead through five. Last time I saw Cuddyer in action, he was being nailed at the plate by Junior Griffey, helping the White Sox eliminate Minnesota in that play-in game. You know, I have to wonder if players many years ago would be wildly out of shape and fundamentally dopey at this time of year. These guys, all day and night, have looked like midseason form. I don’t think they drop off that much over the offseason. And it’s February! 7:45: Still no Manny, but MLB.com’s Ken Gurnick reports that today was “the most serious attempt to date” by the Dodgers to get something done. 7:38: While you are watching this Sox-Twins game live on MLB.TV, here is a quick update from the Pirates. They will start Ian Snell at 1:05 ET tomorrow against Jon Lester of Boston. Ross Ohlendorf, Jimmy Barthmaier, Denny Bautista and Sean Burnett are also scheduled to pitch for the Pirates….Just saw Justin Morneau jawing with a fan after he snared a wicked liner from Jacoby Ellsbury. 7:30: Alexi Casilla’s Texas Leaguer drops behind Kevin Youkilis, and Mike Redmond scores from third to make it 3-0, Minnesota, in the second inning. Tough start for Sox fans. “It’s only the first day.” Of course. 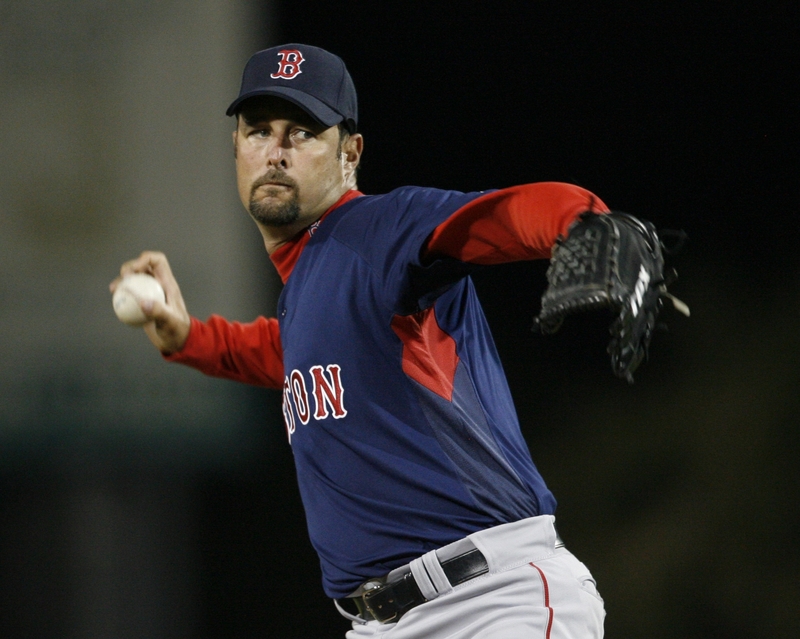 Just Tim Wakefield getting out there and getting comfortable. Just this, just that. But baseball is back and whatever happens now matters. 7:27: Twins strike first as Delmon Young scores ahead of Wilkerson’s throw from right, which arrives on a short hop and gets away. Brian Buscher then scores on a sac fly to center. It’s 2-0, Minnesota, with one out, man on third. 7:26: What do you think of Youk’s fu man chu? Kind of wild to see part of his chin. 7:21: Can we get a Hallelujah? Watching this one live on MLB.TV, and we’re heading into the bottom of the second. One thing that really amazes you right away is the unbelievable lush grass of the Twins’ Lee County facility. It is time to appreciate the groundskeeper. 7:15: Twins have two on, two out, Jason Kubel up, against Tim Wakefield in the first. First night game of the 2009 baseball year. Cool just to see the glare of the lights on the batting helmets, although you really can’t beat watching that day baseball. Kubel pops it up to third, ends the first rally of the year for Minnesota. Just seeing this changes your outlook on life, takes you away from the economy, returns you to your youth, energizes you for the year ahead. Baseball is back, and it’s live on MLB.TV right now. Our friend Josh Rawitch of the Dodgers has one of the biggest blogs on the Internet, and I won’t be surprised if he actually breaks the Manny news right there once it happens. After all, he is the head of PR and his blog goes straight from the club to a massive audience easily the size of any newspaper. He just mentioned Manny in his post. Nothing happening there. 7:02: Twins radio station is about to go on the air with its feed of tonight’s last remaining game on the full slate of First Day, Boston at Minnesota. You will have three ways to follow it live. Get MLB.TV Premium right now. There will be Gameday Audio for both clubs, and one television broadcast feed. Once we roll out the beta of the new 2009 MLB.TV Premium media player in mid-March, you will be blown away with the functionalities, including ability to switch from TV to radio feed while in-stream, and home-or-away for all games. Tonight, just savor the moment: Live baseball you can watch or listen to over your computer. It’s coming in a few minutes. Glen Perkins vs. Dustin Pedroia. Have to get some java first. It has been a long day, but a fun day. Just think how many pitchers have gotten up in the bullpen and how many have run sprints on the warning track; how many ballpark dogs have been consumed already; how many rays people copped today in Florida and Arizona; how many pitches, how many hits, how many runs. Baseball is back. Rob Johnson tied the game at 3-3 with a solo home run in the top of the 9th inning. Randy Messenger threw 2.0 scoreless innings (8th & 9th) in relief. Starting pitcher Ryan Rowland-Smith allowed 2 hits in 2.0 scoreless innings (32 pitches). SS Ronny Cedeno and DH Russell Branyan each recorded 2-hit games. Today’s contest was the earliest spring training game in club history (previous was Feb. 26, 1998). Prince Fielder. Hank Blalock. Mike Napoli. Chris Young. A.J. Pierzynski. Steve Martin told Tina Fey: “Don’t fall in love with me.” With these guys, you have no choice. Major League Baseball players are playing baseball again. You fall in love with the sport and the players all over again, after a winter of trial separation. The game is back. We are watching and listening. 6:15: MLB.TV Premium subscriber alert — Red Sox at Twins coming up at the top of the hour. That will be the second live game of the day on the best technology ever invented. If you really want to feel it today, watch that live game over your computer. 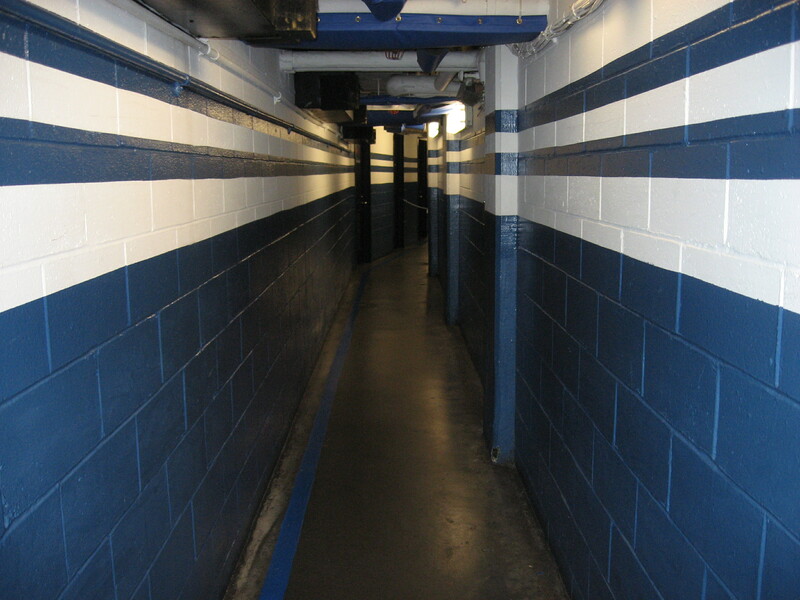 It will be the first night game of 2009, and you will remember what it feels like to have a routine. The first guy to swing a bat in a 2009 night game will be the reigning American League MVP, Dustin Pedroia. All the boxes except for that game are now available on the MLB.com homepage — dive in and study every box and thank Henry Chadwick for making it all possible. Just marvel once more at the structure of a box score, how it tells a story, how much you missed it when it was gone. Angels wound up wailing on the White Sox, btw, 12-3. Thanks to you guys for the comments below, and for all your own blogs like this one from a Twins fan named Lukedog and this one from a former Cubby Bear employee during Sammy Sosa’s reign. There are new MLBlogs cranking up like crazy, and of course aplenty beyond the MLBlogs Network as well. Wherever you blog, feel free to leave your URL below and let’s celebrate this great day together. I know most of you probably go crazy over “pitchers and catchers report,” but this is my favorite baseball day — other than Opening Day, All-Star Game, First and Last Day of World Series. BTW, in case you were wondering why San Diego vs. Seattle doesn’t show up in our mini-scoreboard on the MLB.com homepage, it’s because that is not considered an “official” Cactus League exhibition by the clubs. They play that one as a charity fundraiser and a way to lead into their official Cactus League openers coming at 3:05 p.m. ET Thursday in Peoria, Ariz. Nevertheless, we have a final: Padres 4, Mariners 3, walk-off in the 10th. he’s back with Seattle, Tiger is back on the PGA Tour, and live baseball games are back. MLB.TV subscriptions are hotter than Port Charlotte. Life is good. A pair of 5-3 finals from Arizona: Cubs over Dodgers, D-backs over Rockies. That is the first of 39 Cub Spring Training games, the WGN broadcasters are saying now. Wow. Micah Hoffpauir hit into bases loaded double play in the first inning, and then with the bases loaded in the fifth, he knocked it out of HoHoKam Park. So far that is my Liveday Liveblog Play of the Day. He is trying to make the 25-man roster, and you have to like a guy who gets things started by recovering from that first bases-loaded try by doing what he did. It was not the only salami on this day. Jerry Hairston, Jr. hit the first home run at the newly renovated Charlotte Sports Park when he connected for a grand slam in the fifth for Cincinnati against Rays left-hander Randy Choate in that 7-0 opener. 6:00: Wild finish to the first live MLB.TV game of the year. Giants 10, Indians 7. Runners on first and second after Jesse English beans a batter. Two out. Tying run at the plate is Matt LaPorta, who scored from first on a double his last time up, the same guy the Indians acquired for CC Sabathia from Milwaukee last summer. La Porta crushes one high to the warning track…it could be, it might be…it isn’t! It’s a long out, the Giants congratulate themselves in the dugout, and they are 1-0 in the Cactus League season. 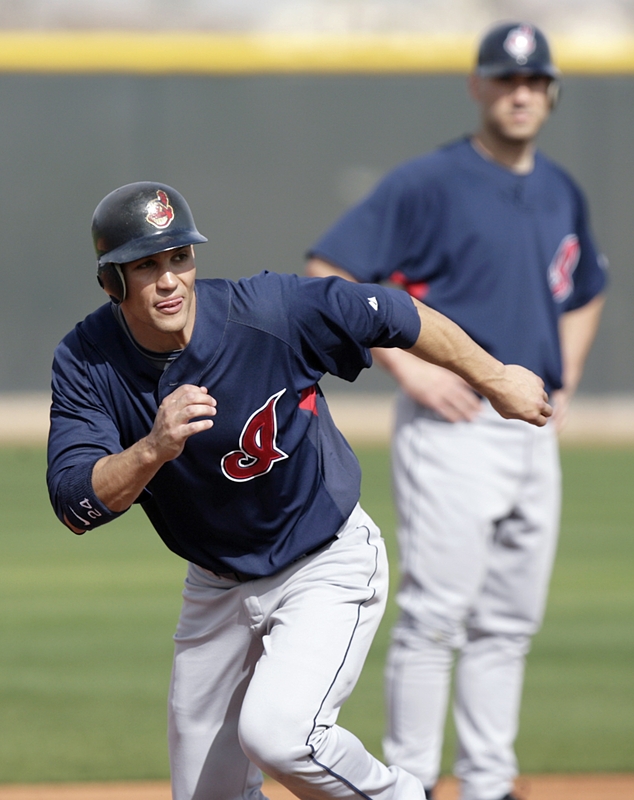 How about Mark DeRosa hitting a three-run bomb for Cleveland in his first game since being traded from the Cubs? 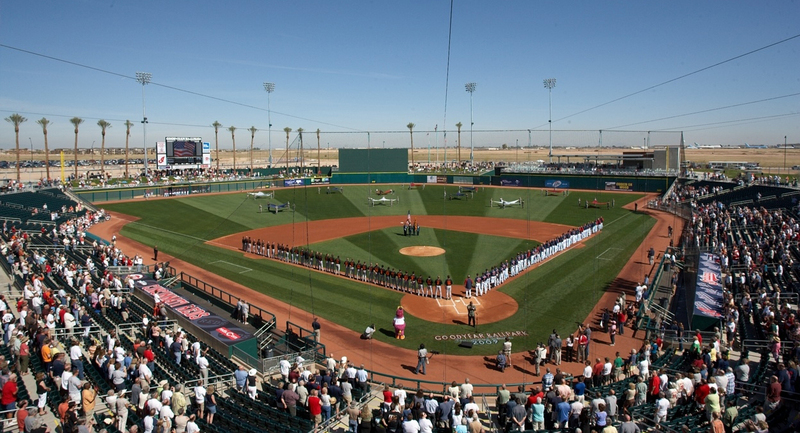 It was a great day in Goodyear, and us MLB.TV watchers have one in the standings. Now it’s time to watch Boston at Minnesota live over MLB.TV from Florida — coming in one hour. MLBlogger Glen Perkins for the Twins vs. Tim Wakefield, who is making his bajillionth Spring Training appearance for Boston. 5:55: Downstairs at our MLB.com offices in Manhattan, had to take a 10-minute break from the computer because I was turning into mush. Cupcakes are half-price in five minutes, but I don’t care because I have to get back and see the finish of Giants-Indians on MLB.TV. Two blue vanilla cupcakes, a Diet Coke, and I am good for a few more hours of Liveday Liveblogging. How are you guys following all of this? 5:40: Brewers 3, A’s 3 — it’s a final. Bullpens emptied during bottom of ninth so you knew it was going to be definitive no matter what, and the Brewers stranded runners at first and second when Mike Rivera popped out to first with two out. That’s the second tie of the day, following Marlins 5, Cardinals 5. Hey, that’s life on the first day of live baseball. There will be no ties this summer or fall. If you are listening to this one on MLB.com Gameday Audio, you are soaking up the beauty of radio baseball. “A good day today for all,” Bob Uecker tells the masses of Brewers fans listening to the opener. “We’ll do it again for you tomorrow. Two oh five, Central Time, the Brewers and Cubs from Mesa. Until then…this is Bob Uecker and…you have been listening to the Brewers Radio Network.” It’s not just the pitcher vs. batter. Not just the umpire’s call. Not just the homers and the putouts. It’s everything that goes into making live baseball an important part of our lives. It’s D-backs 5, Rockies 3 in the ninth in Arizona. While watching the MLB.TV live finish between the Giants and Indians, we have this one on MLB.com Gameday Audio. What a day. We have been going from game to game to game to game. It is a blast. Even if you have just one favorite team, try doing this one day and just soak up everything in baseball. “Arizona has activity in the bullpen,” says the Rockies’ KOA announcer, and, well, that pretty much sums up this entire first day of Major League Baseball games. Bullpens have been busy, oh yes, they have been busy. Meanwhile in Port Charlotte, the Rangers are holding onto a 10-5 lead in the bottom of the eighth — after that incredible 9-1 start with Josh Hamilton going deep. 5:28: Cubs still lead the Dodgers in the eighth, 5-3, and while Manny Ramirez is obviously not playing, the most noteworthy absence at this game is that of Dodgers GM Ned Colletti. It is fueling speculation that Colletti may be in serious talks with the Manny camp. Matt LaPorta just scored all the way from first on a double to the left-field corner, and Cleveland has cut the Giants’ lead to 10-6 in the bottom of the eighth at Goodyear Ballpark. Then there’s another double, and now it’s 10-7. Bruce Bochy is out to make a pitching change, bringing in non-roster invitee Francis Beltran. Think there isn’t competition on the first day of live games? This game is live right now on MLB.TV and hope you are watching with the rest of us! Those Red Sox will be on MLB.TV in a couple of hours. Make sure you have your 2009 subscription, which is $10 less than the 2008 cost. 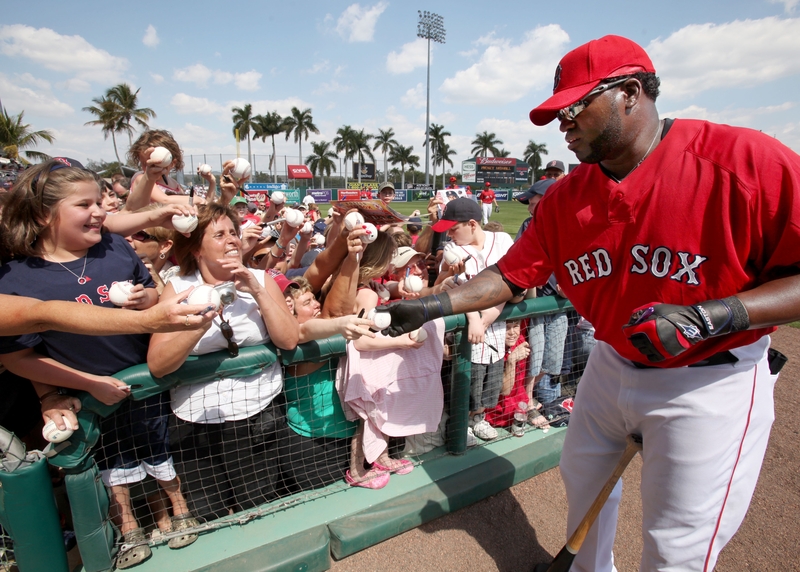 The second live MLB.TV game of the day features Boston at Minnesota in Lee County. Meanwhile, Uecker is reporting via MLB.com Gameday Audio that the Brewers have just tied the score at 3-3 in the bottom of the eighth against the A’s. Inning is over. “He hit a frozen rope right at him!” Thanks, Ueck — on this day, every baseball cliche is like oxygen in our lungs. Hope you guys are all following us on the Official MLBlogs Twitter. Just follow @mlblogs if you already tweet. Welcome to lots of new followers today like MetsGal of Hot Foot, who just joined us there. e’re all working hard at this,” he says as the seventh inning wraps up. Hearing his mannerisms after the long winter just brings it all back. In the eighth, the Brewers are threatening and he says, “Hit one out of here and let’s get through the ninth and get out of here.” What if we don’t want to get out of here? Baseball is finally back and actually it is kind of a bummer whenever each game goes final. We want this day to last forever. Really. Here’s that final box as the reigning American League champs had fun but no runs in their first return to action since the World Series. 4:52: First extra-inning game of the year: Florida 5, St. Louis 5 in 10 innings. Yes, a tie is allowed on the first day of live baseball. It’s all about the players getting their work in. The Marlins scored three in the eighth to tie it, and the teams combined for 24 hits and a lot of fun for the Jupiter crowd. Colby Ramus, considered one of the three best prospects in baseball, looked great in his 2009 debut: a double, single and walk batting second for the Redbirds. 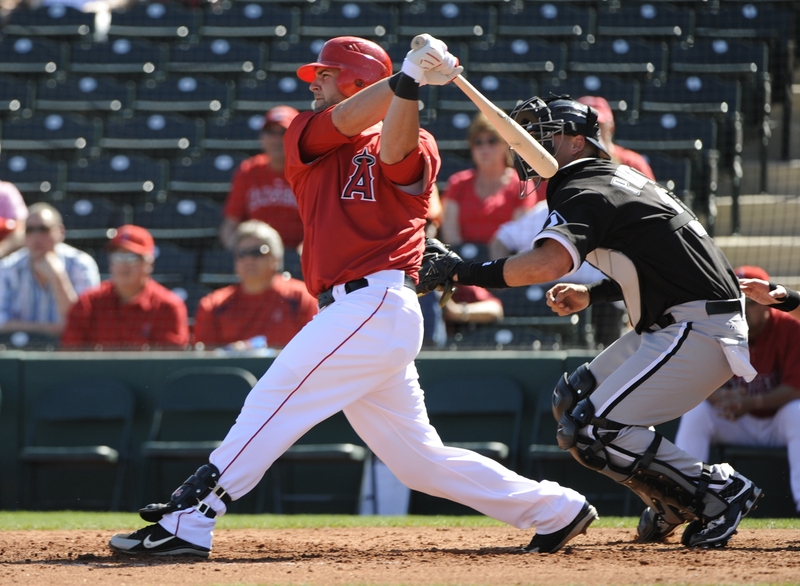 Albert Pujols was back, 1-for-1. If you drafted Hanley Ramirez high for your Fantasy team, then you will be happy to know he swatted a homer in the sixth. 4:32: Listening to Dodgers at Cubs on MLB.com Gameday Audio, going back and forth between the WABC (Dodgers) and WGN (Cubs) feeds. Great to hear both perspectives. It feels like just last October, when the Dodgers ripped through Wrigley in two nights of another quickie Cub exit. James Loney just got thrown out easy trying to steal second. Meanwhile, MLB.TV is on here at the office, and Mujica is on the mound protecting a 5-3 Giants lead over the Indians, and the announcers are chatting in the booth and they just said the words “blue skies” about six times within one minute. Then, with one on, Nate Schierholtz hammers a home run onto the berm seating in right-center, making it 7-3 San Francisco. This guy is the real deal; I covered him in Beijing where he put on a clinic every day for the USA Olympic team. What a sweet swing. Here is Chris Haft’s MLB.com story about him; I think Schierholtz will hit stardom quickly, and obviously he is wasting no time today. Did we mention blue skies yet? 4:29: Just got the A-Rod home run pic (AP) you see here, feel free to drop that on your MLBlog. Pretty dramatic opener for Mr. Center of Attention. 4:16: All the finals so far are on the MLB.com homepage scoreboard. The record will show that this is the first BOX SCORE that I witnessed in 2009: Mets 9, Orioles 3. It feels so reassuring to see the familiar digits next to names, the art of the box score, just analyzing it and letting it tell a whole story. Of course, what tells you most surely that this was the first day of live baseball is the 15 pitchers used. No one went more than two innings, typical of Day One. What I noticed most about the box score: 70 degrees, partly cloudy. game-winner. What I noticed most about the box score: 74 degrees and sunny. The Yankees-Jays box was just now posted as I am typing this, and what I notice most from the Bombers’ 6-1 victory is not the 16 pitchers used but “72 degrees and sunny.” Pirates won that won, 8-2, and here’s the box that says it was 77 and sunny. Hey there, Mark! I am very excited about the new HD technology with the MLB.tv. To be completely honest with you, I’m thinking about dumping my satellite because I realized that the only thing I watch is local channels and Sports. That being said, it is more cost effective to be able the watch games on my computer as opposed to paying monthly for Satellite AND the MLB package for Direct TV. So there ya go! runs. You are happy. We are happy, too. Baseball is happening. Listening to this one on MLB.com Gameday Audio. had just gone up 3-2 after Mike Napoli raked Octavio Dotel for a double to the wall. preventing the Angels from extending their lead. I love baseball. Maybe you noticed that an MLBlogger is starting a Major League baseball game tonight. Glen Perkins will be on the hill for the Twins against Tim Wakefield and the Red Sox. If Joe Mauer plays, then that game features the four guys who finished 1-2-3-4 in the last American League MVP voting — classic. Dustin Pedroia, Justin Morneau, Kevin Youkilis and Mauer, in order. That will be the second game of the day live on MLB.TV. Do not miss that one. Hope you are enjoying the current MLB.TV opener now on your computer. Public-service announcement: Indians single-game tickets go on sale at 10 a.m. ET Saturday. Every time I see a club announce that, I get chills. 3:52: “Giddiness! We have a ballgame! !” That is the headline of our friend and Dodger blogger Emma. Every now and then you keep seeing other blogs and message posts and interviews with MLB team owners and fans and all of us who really sum it up with only a few words. “We have a ballgame! !” is one of those things you hear on this day. Gotta love that! She knows that her Dodgers went to the last National League Championship Series and that they are loaded with young guys and a great manager and coaching staff — no reason to think the Dodgers couldn’t be in the World Series this fall. Whoever gets there, it all began right now. We are watching and listening all day. This is an amazing day. 3:42: Mets have been teeing off on Baltimore in the first game for those two teams. That’s OK with the Orioles. They have 37 pitchers in camp, and they have gone through six pitchers already here in the eighth inning, with the Mets ahead, 9-3. Does he have a five-man rotation in mind? 3:24: Rays haven’t scored since they temporarily tied the score at 3-3 in the top of the seventh after play resumed during the clinching Game 5 of the last World Series. It’s the eighth inning and the Reds lead Tampa Bay, 5-0. Rays have two hits. Ah, well. We have heard cowbells and we know they are having a blast with the defending American League champions back on the field in their Spring Training home in Florida. 3:20: “Grady Sizemore leads it off for the Tribe against Tim Lincecum, the reigning Cy Young Award winner making his first start.” What I have been waiting to hear. It could be an All-Star Game matchup. It could be a World Series matchup. Just think, the Giants have not won it all since 1954 and never in San Francisco. The Indians have not won it all since 1948, the longest drought other than the Cubs’ drought (101 years). The Indians were heavily favored and lost to the Giants in 1954 when Willie Mays made “The Catch.” What if those teams met in this Fall Classic? It could happen. This matchup might be a harbinger, and in late October we could remember this day way back when. Lincecum just struck him out. Jhonny Peralta then rips a single to center. A long, long, long, long, long, long season of LIVE MAJOR LEAGUE BASEBALL on MLB.TV is under way, folks. There is no stopping us now as baseball fans. Life is good. 3:15: Giants at Indians. First-ever MLB.TV live game of 2009. There will be thousands more. In fact, 2,430 Major League Baseball regular season games. You can watch all of them live and out-of-market, and even if it’s in your market you can watch them all on-demand after they are played. 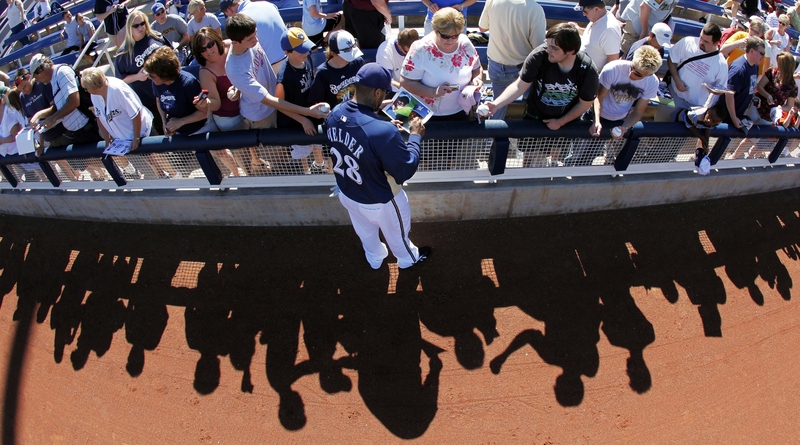 Plus you get more than 100 live Spring Training exhibitions like this first one, so dig in. Indians just got out of a quick jam, with the Giants leaving runners on first and second. Now comes the moment I have been waiting for all week: LINCECUM VS. GRADY. Bring it on. Baseball’s back! 3:11: Pregame activity for the Giants-Indians live game on MLB.TV, so back to Braves at Tigers on MLB.com Gameday Audio for a bit. I have to report that Detroit will not score in every inning of 2009, after all. In fact, they blew a 3-0 lead and the Braves are now up, 4-3, in the seventh. 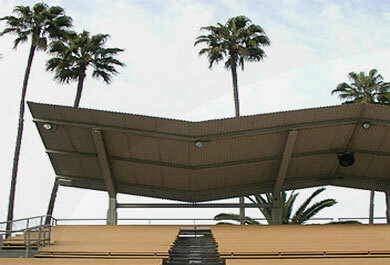 Welcome to the first day of Spring Training exhibitions. Guys don’t stay around for long in these games. Pitchers go an inning or two, prospect after prospect enter the game, and pitchers run their sprints on the warning track. Beat writers venture down to the clubhouses around the fourth or fifth inning and interview starters before they head for the golf course. This is life. Obviously the scores don’t matter. What matters is hearing the crowd in the background of the radio broadcast, seeing the superstars of your life, hearing the crack of the bat and the pop into the mitt, and knowing that it is just a little bit warmer now even if you are typing this in 36-degree windchill outside one day in late February. Welcome to Spring Training. We are following live baseball! 3:03: Two minutes till the first MLB.TV live game of 2009! LINCECUM VS. GRADY — get it. 3:01: Pirates 8, Phillies 1, bottom of the sixth in Bradenton. Break up the Pirates! Will this be the year that the Pirates follow a Steelers Super Bowl victory with a World Series title? It happened 30 seasons ago. That was the last time the Pirates won it all. It could happen again this year. Anything could happen this year. That is why today is so magical. Fans of every team think their team can win. Be sure to leave full URLs in the comments below to show what you are blogging about on this incredible day. Hard to believe we are starting live baseball with a full-plus slate of exhibitions, including 15 featuring all clubs, plus the BC @ Boston split-squad game. Got your MLB.TV Premium? Do it now, because here comes LINCECUM VS. GRADY. First MLB.TV live baseball game of the year is at 3:05 p.m. ET: Giants at Indians. See it live and join us all day and night here on the MLB.com Liveday Liveblog! 2:39: Our Yankees correspondent Bryan Hoch reports that Alex Rodriguez walked in his first at-bat of the spring. 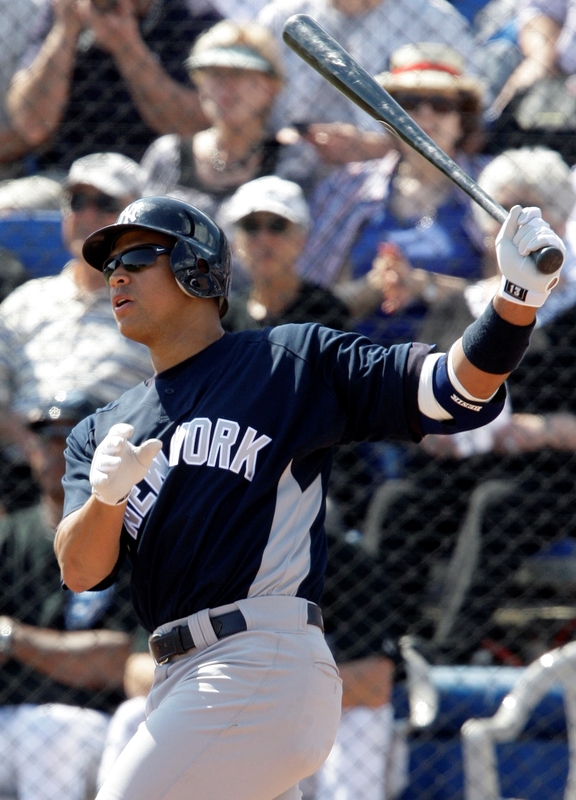 A-Rod received a mixed reaction from the Dunedin crowd, with applause coming from behind the Yankees’ dugout. That will be the case all season, no doubt. In the second time up, A-Rod homered off Jays lefty Ricky Romero. The Yankees hope that will be the case all season as well. Here is Bryan’s story on MLB.com. While McLane is in the booth in place of longtime broadcaster Milo Hamilton for a bit, the Astros finally break up the scoreless tie and put their first run of 2009 on the board. The Astros’ play-by-play man tells him: “Drayton, I just got a text from (club president of business operations) Pam Gardner. She said since they didn’t score with Milo on the mic, could you stay there?” Hamilton comes back for the next inning and says jokingly to McLane: “I understand you got a contract there?” McLane says: “Yes, they offered it for 162 games.” Alas, McLane will have a team still to operate this year and is not going to be a broadcaster. 2:25: Just switched to the MLB.com Gameday Audio feed of Washington at Houston. 1-2-3 inning for Shairon Martis. The last time I saw him was at Beijing airport, going through customs. We were in line to go from the Olympics (he had been pitching for Netherlands), and he said that next week he was going to be going up to the Majors with the Nationals. After his call-up last September, Martis is back here now, ready for a big year. When you think of him at this time of year, you can’t help thinking of the 2006 World Baseball Classic, when he threw that no-hitter for Netherlands. 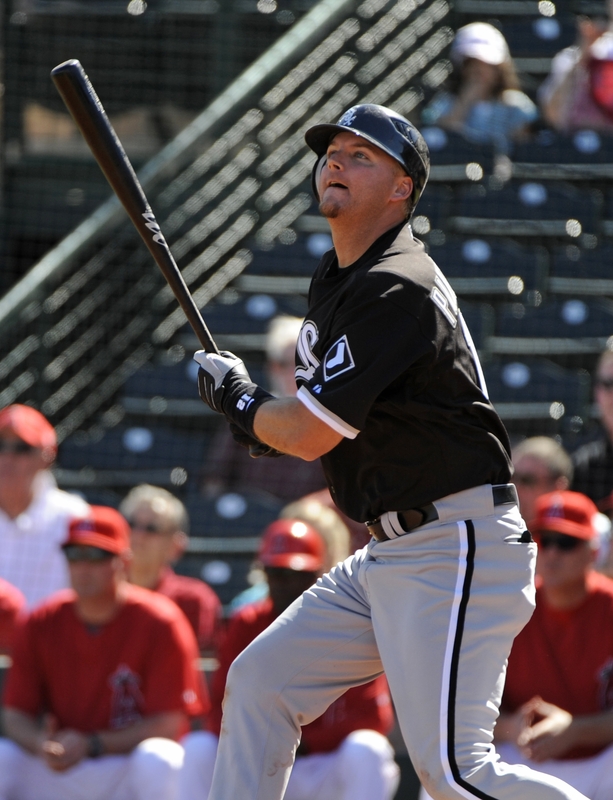 We’re scoreless in the top of the fifth in this game, one single apiece, and I want to hear some Adam Dunn action. They are saying there is some cloud cover in Kissimmee. If you are like me in a northern state, do you feel sorry for anyone when they say that? Here in the MLB.com headquarters in Manhattan, I consider it my duty to report that it is sunny and feels like 36 degrees. You know when you are at a Spring Training game, and the P.A. person always announces the temperature of the home team’s Major League town? They are probably doing that right now. 2:22: Someone named Ace Bradley just started an MLBlog and said it all in just one initial post. 2:10: Joey Votto just broke up the no-hitter. Clean single up the middle for the Reds in the fourth, their first hit of the spring. Grounder through left side by Brandon Phillips, now the Reds have two on and one out for Jay Bruce. Middle of the order for the Reds is a lot different without Adam Dunn, but if Tavaras is on base a lot, these guys will drive in some runs. Wow, Votto just got absolutely nailed at home on an 8-2 putout, as Bruce singled to left and Fernando Perez threw a bullet. He was out by a good 10-15 feet. Spring Training for third base coaches, too. This one is still scoreless. Rays fans are happy with life. AL champs coming up for bottom of fourth. More cowbell. Rays pitching coach Jim Hickey is being interviewed on MLB.com Gameday Audio. What does he look for? “Early in Spring Training, you’re not looking for a great performance, just solid mechanics, throwing strikes, getting used to getting up on the mound. Then after maybe the fourth week you look for performance.” What did the 2008 experience do for this young staff? “I don’t think anything would take the place of what happened last season. It accelerated the learning curve of everyone. It was a great experience for these young guys to go through that. Nothing can replace it.” He said most of the guys who threw long into the last season won’t begin pitching for another eight or nine days, giving the other guys a chance to show themselves. 2:08: Rays have a no-hitter through three. They also are in the process of ending their streak of 48-hour games at one, dating back to last year. Nice play by Shawn Riggans to find a popup and quick movement to go get it. Announcer notes that his legs are probably “a little heavy” from all the squatting he has done so far this spring catching the pitchers. Carlos Hernandez went two innings for Tampa Bay, looked great. Don’t they have enough pitching? 1:47: I am switching back and forth between MLB.com Gameday Audio feeds, just switched to Reds at Rays. I just heard a cowbell! First cowbell of the year. There will be more cowbell. Make sure you have your MLB.TV Premium subscription right now if you haven’t already. You do not want to miss LINCECUM VS. GRADY coming up at 3:05 p.m. ET. That matchup fires me up. Seeing it live on MLB.TV over your computer just reminds you how great it is to be a fan right now, as opposed to the ’90s or ’80s. It always has been a great game to follow as a fan. But nothing is as cool as being able to see it live anywhere over your computer. “You gotta love Rays baseball!” is the commercial spot between innings. We’re going into the bottom half of the third inning, scoreless between the reigning American League champs (funny to say that for Tampa Bay) and a Dusty Baker team that is going to run like crazy this year. Cincinnati is my darkhorse candidate for Shocktober, will say that right now. Gabe Gross batting against Edison Volquez. I still love just listening to the radio feed of a Major League game, too. Possibly the highlight of the new MLB.TV Premium will be the ability to switch between TV and radio broadcast feed at your leisure throughout any live game. That version of the media player will come in beta in mid-March. But you have to get MLB.TV right now or you are kinda left out of the generation. 1:43: Above is my favorite photo of the day so far. 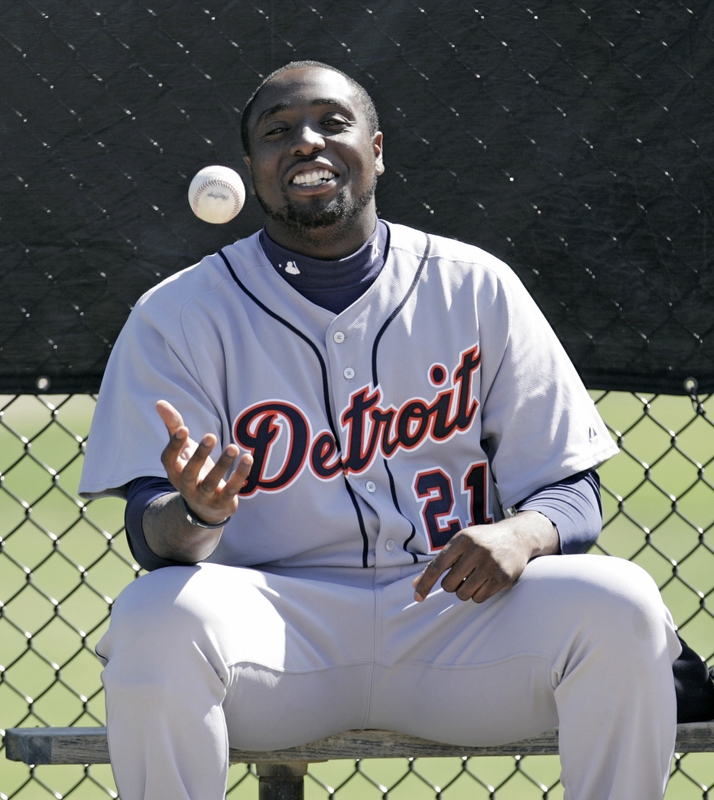 This is what Detroit fans want to see this year: Lots of smiles from D-Train. Tigers have scored in every inning so far in 2009. They will play at least 1,458 innings this year. Wonder how many of those they will score in this season. Everything you see right now makes you wonder how it will all turn out late this autumn. Detroit 2, Atlanta 0 in top of third. Mariners just announced that outfielder Freddy Guzman has fractured the hamate bone in his right hand. He will have surgery to remove the bone. Guzman is scheduled for surgery on Wednesday, March 4. Guzman surgery will be performed by Dr. Don Sheridan. An average recovery time from a surgery of this type is four to six weeks. Join me in the comments on this article we just posted on the MLB.com homepage, looks like I need some comment love! What do you hate? This year I am saluting the haters! I actually did have to show some love to my girlfriend so the profile pic is what’s sitting on her office desk. Didn’t want her to think I only love MLBlogs. The Most Recent Activity feed on the MLBlogs homepage is evident of the fast increase here in blog creations. This is great news as always, and here is some more great news: all MLB.com beat writers are either MLBloggers or in the process of creating an MLBlog. We will gradually aggregate all of them by name here, and of course MLB PRO BLOGS also are always indexed in the drop-down menu on the MLBlogs homepage. Who’s ready for Spring Training? Here is my story on the MLB.com homepage about the Spring Training schedule. Happy Holidays from the Phillies Ballgirls. And congrats on the new Ballgirls for 2009 that were just named. More holiday themes from Alyssa Milano and Lisa Winston. Make sure you check out the Christmas tree they put where once upon a time there was a pitcher’s mound at Yankee Stadium. Congrats again to everyone who made the first MLBlogs Top 100. I mailed my Hall of Fame Ballot in yesterday. No sense holding onto it until the Dec. 31 deadline to get it back to the BBWAA. I checked three names. Any more and I felt like it was the Hall of Guys Who Had Right Fine Careers. Our annual MLB.com article in early January will say how we all (15 MLB.com voters) voted. Happy First Birthday to Baby Paul. Bally is doing some serious player blogging. Gotta love it when a player goes around blogging on other people’s posts within the MLBlogosphere. Another new player is about to crank it up here. team. 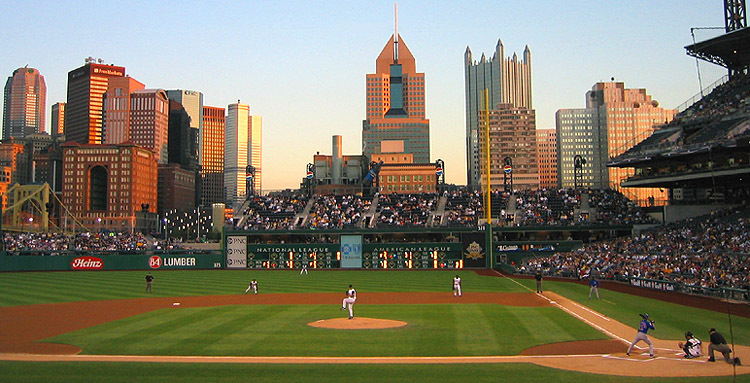 There are bad teams, yes, but the Pirates seem to lose with a sort of strange integrity. It has been 15 years without a winning squad in Pittsburgh, and 16 is approaching quickly. Blogging helps me control all my “crazy” feelings I have for the Bucs. Like I said, I love them. They are so entertaining and have some new found bright spots with players like CF Nate McLouth and SP Ian Snell. Even so, they seem to push a little to hard to win a single ball game (i.e. Opening Day against the Braves). I love to blog because I care about the game of baseball, and while opinions can sometimes only be personal, I am always happy about with sharing my opinions on the lovely and talented Pirate bunch. My favorite post would have to be my wrap on the 2008 Trading Deadline. The post entitled “August is Four Sail” is based off of the rock album “Four Sail” by one of my favorite bands, Love. I enjoy this post quite a bit because of what I wrote on each of the trades, analyzing and discussing what they did for baseball. I also went ahead and intertwined some personal notes in the article, some of which are hilarious to me (i.e. the title). When I was doing a sports blog on blogspot.com, I wrote a story concerning the steroids issue in baseball. My blog wasn’t very popular at the time, and I wasn’t getting many views. In a matter of days though, I started to get some “intense” comments discussing the issue. By the end of the week, I had 87 comments on one singe blog post. It was truly funny and strange. What is your favorite blog, including at least one MLBlog? Bryan Hoch’s New York Yankee blog is probably my favorite. I am huge New York Yankee fan, thanks to my Bronx-born father, and Hoch does a terrific job writing about them. His posts about the Yankee-Met interleague series were terrific and very true. Everyone should check them out! What would you be doing if you weren’t blogging? Well, as I said before, I would have to be doing something to channel the emotions I get from watching Pirates baseball. I’d probably be re-learning how to play the Violin, my favorite instrument. Writing seems to be the only way to stay calm, so I think I’ll just stick to that. Where do you think the blogosphere is going? Just like YouTube, blogging is another way for people to share and discuss other people’s opinions. It’s a great way, especially in sports blogging, to hear the views and different insights from tons of people around the world. Still, who knows where blogging will be in 20 years from now. First, there’s the New York Yankees. They’re the greatest sports franchise in the history of sports. They have had some of the greatest athletes to ever play professional sports, and no matter what people opinions are about them, they have 26 trophies proving their dominance. My favorite players include captain Derek Jeter, Bobby Abreu, and the greatest closer in the history of the MLB, Mariano Rivera. Rivera is the best of the best. 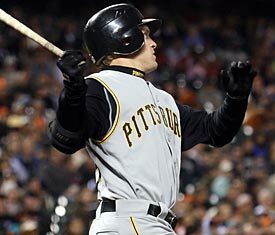 Then, there is the magical Pittsburgh Pirates. Making a long story short, the now infamous MLBlogs tale of pitcher Shawn Chacon is nothing short of a lie. When he was traded to the Yankees in July of 2005, I was totally opposed to the idea of giving away prospects “for a bum like Chacon,” (yes sadly, I did say that). After a terrific half-season in New York (7-3, 2.85 ERA), then an excellent post-season performance against the LA Angels of Anaheim, the “Chac Attack” became my favorite player. He was dealt to the Bucs in July of 2006, and well, the rest is history. I feel in love with a team I thought I would never grow onto. How could I go from rooting for a team like the Yanks to a team like the Bucs? I saw a lot of upside to the team other than just my favorite player, and after experiencing the roller-coaster season that was 2007, I now bleed Bucco blood. I am a huge history buff. I was so more when I was a little younger, since baseball has now completely taken over my life, but I enjoy all aspects of history. It is my favorite class in school, and the ways civilizations have changed throughout it is astonishing. History also wraps all the other subjects into one, discussing the background of literature, language, math, and even science. It’s the foundation for any culture. I want to say the Pittsburgh Pirates at .500 to end the season. I really do. I’ll keep it simple, though, and just say going to a baseball game at Dodger Stadium (since I live in LA) with my buddies and family. I love going to ball games. No matter what the condition is or which teams are playing, I get pumped and go crazy to just enjoy the game of baseball.